This book describes the application of c-axis aligned crystalline In-Ga-Zn oxide (CAAC-IGZO) technology in large-scale integration (LSI) circuits. The applications include Non-volatile Oxide Semiconductor Random Access Memory (NOSRAM), Dynamic Oxide Semiconductor Random Access Memory (DOSRAM), central processing unit (CPU), field-programmable gate array (FPGA), image sensors, and etc. 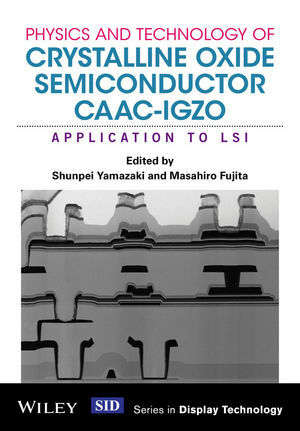 The book also covers the device physics (e.g., off-state characteristics) of the CAAC-IGZO field effect transistors (FETs) and process technology for a hybrid structure of CAAC-IGZO and Si FETs. It explains an extremely low off-state current technology utilized in the LSI circuits, demonstrating reduced power consumption in LSI prototypes fabricated by the hybrid process. A further two books in the series will describe the fundamentals; and the specific application of CAAC-IGZO to LCD and OLED displays. • Outlines the physics and characteristics of CAAC-IGZO FETs that contribute to favorable operations of LSI devices. • Explains the application of CAAC-IGZO to LSI devices, highlighting attributes including low off-state current, low power consumption, and excellent charge retention. • Describes the NOSRAM, DOSRAM, CPU, FPGA, image sensors, and etc., referring to prototype chips fabricated by a hybrid process of CAAC-IGZO and Si FETs. Dr. Shunpei Yamazaki is an authority on semiconductors, memory devices, and liquid crystal displays. Listed on over 4,000 US utility patents, Dr. Yamazaki was named in the Guinness Book of World Records as holding the most patents in the world; hailed the most prolific inventor in history by USA Today (in 2005). His most notable work is on the thin-film transistor -- a significant discovery being a crystalline structure in Indium gallium zinc oxide (IGZO) material, which he discovered "by chance" in 2009. Today Dr. Yamazaki is President of the Semiconductor Energy Laboratory (SEL), where he and his team pioneered the unique development of ultra-low-power devices using CAAC-IGZO technology. A joint venture with the Sharp Corporation manufacturing smartphones using crystalline oxide semiconductors (IGZO) is a global first. In 2015 Dr. Yamazaki received the SID (Society for Information Display) Special Recognition Award for "discovering CAAC-IGZO semiconductors, leading its practical application, and paving the way to next-generation displays." His paper on CAAC-IGZO ranked in the top 15 most downloaded papers of Wiley Electrical Engineering and Communications Technology journals, 2014. Dr. Yamazaki is also an IEEE Life Fellow. Masahiro Fujita: received his Ph.D. in Information Engineering from the University of Tokyo in 1985 on his work on model checking of hardware designs by using logic programming languages. In 1985, he joined Fujitsu as a researcher and started to work on hardware automatic synthesis as well as formal verification methods and tools. From 1993 to 2000, he was director at Fujitsu Laboratories of America and headed a hardware formal verification group developing a formal verifier for real-life designs. Since March 2000, he has been a professor at VLSI Design and Education Center of the University of Tokyo. He has authored and co-authored more than 10 books and 300 publications, and has been given several awards from scientific societies. His research interests include synthesis and verification of hardware and software systems.